Petunias are a classic hanging basket flower originally from South America. No spring program is complete without the vibrant colors petunias bring to your garden center display. With bigger flowers than calibrachoa, these plants can put on a show for your front display to attract customers inside. They work well in hanging baskets or as a flowering cascader in combination baskets. For best results with Petunias, we recommend using a constant feed program of 250-300 ppm N with an E.C. between 1.5 - 1.8. Remember to leach periodically in order to prevent salt build up. Maintain a pH between 5.8 - 6.2. 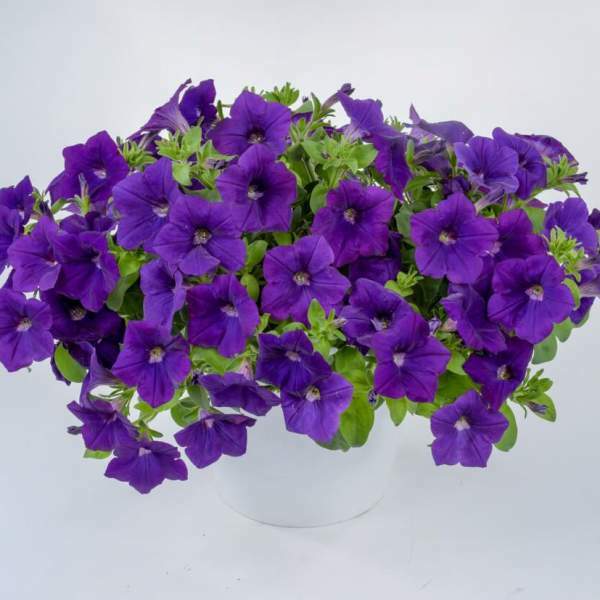 Petunias require high light intensity (full sun) for peak finishing. If you grow them in the shade, you will get stretching and lower bloom performance. For the long nights of the winter months, supplemental light is recommended. Pinching is recommended 5-10 days after transplantation. A second pinch may be necessary depending on the size and shape of the final pot. Space pots adequately to allow for light penetration and airflow between foliage of adjacent pots. We recommend eight inches for 4” pots and twenty-four inches for 10” pots. Pinching and high light intensity are the best ways to control height. An initial pinch is recommended, but additional pinching may be necessary to shape your final product. Bonzi has been shown effective in 4” pot production. Whiteflies, aphids, leafminers, and thrips are the biggest pest problems with Petunias. Cascadia Blue Omri are not prone to many diseases, but watch for botrytis while the days are short. This grey rot is usually associated with wet or humid conditions. You can prevent botrytis by allowing the plant to dry out between waterings, allowing for good airflow in your greenhouse, and spacing to allow the sun to penetrate to the soil level. The most common chemicals used to treat botrytis are Medallion and Banrot. Use them as a drench according to each label’s instructions. We recommend planting 4-5 starter plants per 10 inch basket. Use a well-drained soil in your baskets and plant your starter plants deep, allowing the ellepot to be completely covered by the soil. If you are planting 4” pots, 1 plant per pot should be sufficient if you have enough time. Plant it directly in the middle of your pot.